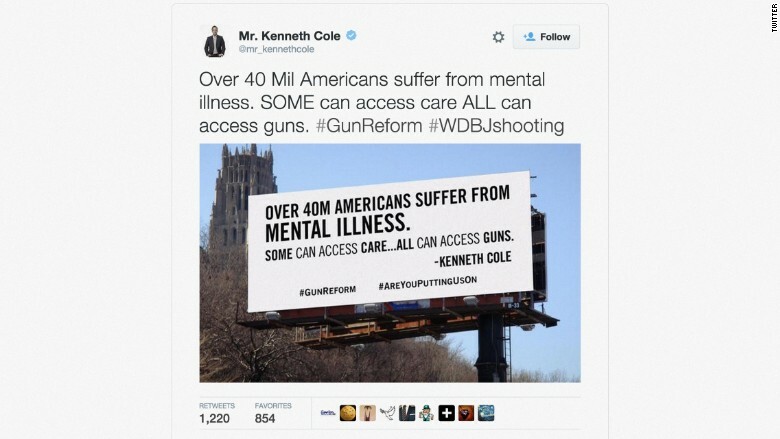 A psychiatric group complained that Kenneth Cole's gun reform billboard is off target and it wants him to take it down. The American Psychiatric Association slammed the fashion designer on Thursday for a billboard that read: "Over 40M Americans suffer from mental illness. Some can access care...All can access guns." The message was signed "Kenneth Cole" and included the hashtags #gunreform and #areyouputtinguson. The sign looms over Manhattan's busy West Side Highway and the APA wants it removed. APA President Dr. Renee Binder said the billboard message is detrimental because it incorrectly links mental illness with gun violence and the need for gun control. "It provides the gross misimpression that people with mental illness are violent," Binder said. "The vast majority of people with mental illness are not violent and most acts of violence are not committed by people with mental illness." In response to the roadside sign, the APA tweeted a series of messages expressing their disappointment in Cole. Binder did note that Cole's billboard highlights two important points -- over 40 million Americans suffer from mental health issues and access to care is inadequate. Cole, who did not respond to the APA's tweets or to CNNMoney's requests for comment, tweeted this message last week: "This ad not meant to further stigmatize those suffering from mental illness community in need & already under-served. #MentalHealth." Gun control is not the first social issue Kenneth Cole has taken a stand on, nor is this the first time he's received criticism for his comments. Cole has voiced support for liberal issues such as equal pay for women and marriage equality, but has received substantial backlash for tweets he made about Syria and Egypt. In 2013, during the debate over America's possible engagement in the Syrian civil war, Cole used his personal account to tweet: "'Boots on the ground' or not, let's not forget about sandals, pumps and loafers. #Footwear." In 2011, when deadly protests broke out in Egypt, Cole tweeted: "Millions are in uproar in #Cairo. Rumor is they heard our new spring collection is now available online... -KC." The tweet, which included a link to the company website, and the initials KC signified that he wrote the tweet himself.